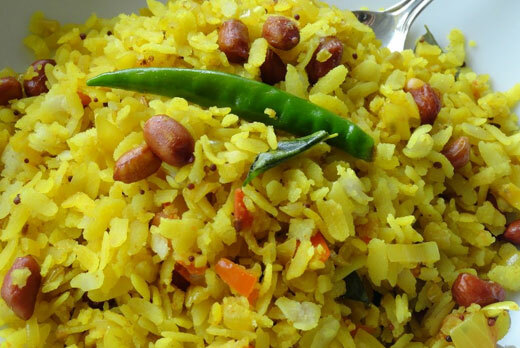 Chiwada is popularly known as 'poha' in India. Indore and Ujjain are known to have chiwada in breakfast. In fact, it is 'pounded rice flakes'. It is healthy and filling too. People of all age groups can easily digest it. No doubt, chiwada is a tasty delicacy in India, but the Malawa region of Madhya Pradesh remains the most dominant place as well as the hometown of poha! Chiwada should be washed in water and kept aside in a sieve so that excess water is drained. In another pan, take a little oil and put mustard seeds into it. Let the seed crackle for sometime. Add salt and turmeric to it. Also add green chilies. Sauté it for sometime and add all the vegetables excluding the potatoes because it is already boiled and will get overcooked. Simmer the flame and let the vegetables cook for 5-7 minutes. Cover the pan. Check after sometime. If vegetables are considerably cooked, then add poha to it. With this, also add potatoes, coriander powder and garam masala. Mix well. Add limejuice and little sugar. Garnish it with coriander leaves and serve it hot.